The archiving dilemma is a major one for many organisations today. Even in the digital age, there is little doubt within businesses and institutions that the storing of information in physical form is valuable both for day-to-day needs as well as preservation purposes. Discussion arises over whether archiving justifies the best use of space. With office plans becoming smaller, companies are right to question whether they can afford to devote precious square meters to folders, binders and volumes when other departments are competing for more room. Thankfully, storage expertise is developing fast to provide timely solutions that satisfy both sides of the argument. 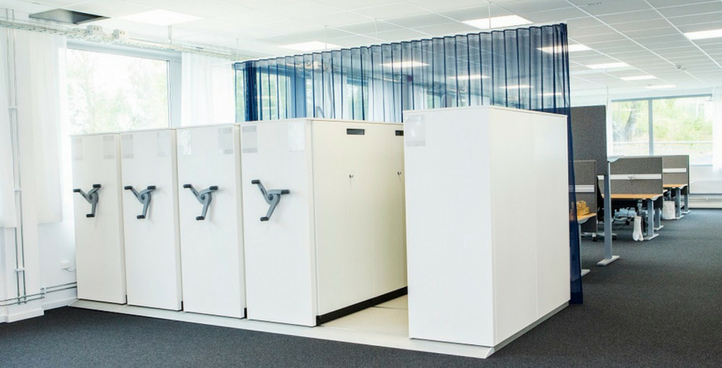 Leaders in the industry today design archiving systems to respond to space-saving needs with mobile shelving that allows units to close ranks, dramatically freeing up space that would previously have been needlessly occupied. Mobile shelving systems have been around for many years, demanding pure muscle and effort from archivists to move around. Changes in technology and materials, however, make modern systems move literally at the touch of a finger. Many mobile shelving structures have a flywheel installed that easily and swiftly opens an aisle between the needed units. A precisely-engineered system of gears makes ridiculously light work of moving document-laden shelves about. Meanwhile, mobile shelving is accelerating into electronic operation; replacing the turning of the flywheel into an effortless tap of a button. Early challenges of malfunctions and maintenance requirements have rapidly been overcome as shelving systems are equipped with reliable and durable technology. To see how archiving systems can expand your available space, talk to the dedicated professionals at Storage Systems. Contact Us!